Welcome back to Covers from the Unknown! Today’s episode looks at The Mighty Thor 15, the rare 1:25 variant cover. 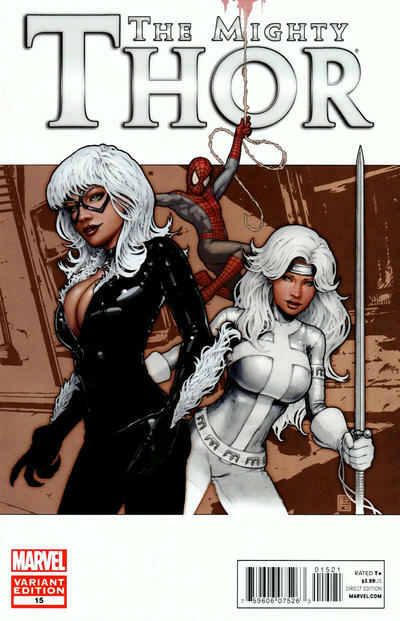 This was published in June 2012, and has an awesome Black Cat and Silver Sable cover! This is definitely one of the lesser known, yet still great Black Cat covers. This variant was part of the Amazing Spider-Man in Motion variant covers that month. They were some very cool covers that month, especially the Daredevil and Fantastic Four covers. While Thor has a print run of approximately 33,000 that month, that means there are only about 1,300 of these out there. That seems like a very small number for the Spider-Man fanbase. You may want to pick up one or two and sit on these. For now, these are not hard to come by. They are all under $20 on the bay, with a lot under $10. My belief is eventually, these will heat up. Happy Hunting fellas! Nive cover,.had no idea about this one. Same here; never seen or heard of this sweet cover. It is a sweet cover. Thank you for the heads-up! Definitely had no idea, thanks! So, stupid question time. I’m always been under the understanding that, for example, any 1:25 variant covers were available if you ordered 25 books. Do they actually make that percentage of books and make them available to whomever? Wow guys, good job! You wiped out ebay of these! I only see 2 left!